Our Pilates studios are cardio in nature with excellent results. Interestingly enough, if Pilates is practiced correctly it is completely fat burning (operates on the cardiovascular energy system) and also helps to enter the second energy cycle which is for muscle strengthening and endurance. As a clinical nutritionist Charlotte assists her students with advice, or personalised eating plans to help them reach their health and fitness goals. Clients from any studio can come to this Saturday morning class for only an extra R100 per month for those coming once a week or an extra R200 per month for those coming twice a week. FIRST CLASS IS FREE. NO CONTRACTS. Refer a friend special. 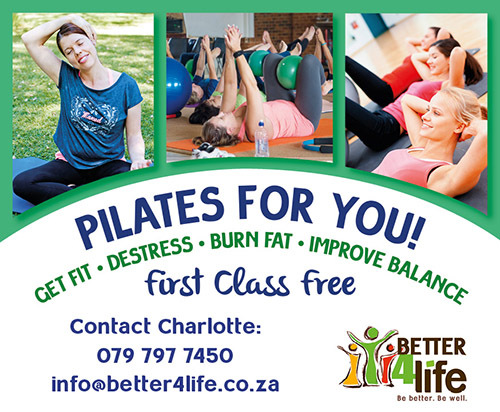 Contact admin@better4life.co.za or 079 797 7450 / 084 588 6470 for more info. After quite a few years of doing pilates I am now moving. Just wanted to say thank you – I enjoyed the classes and the love and fellowship of all. I will miss the people and the exercise. God bless you and may your classes go from strength to strength. – Love Cheryl.